This is the final year that Grassley is eligible to serve as ranking member — the most powerful minority member, and, if Republicans retake the Senate, the chairman — of the Senate Finance Committee. His hope is to move over as ranking member of the Judiciary Committee, or failing that, the Budget Committee. But for that, he needs the support of his fellow Republicans. And if he undercuts them on health-care reform, they will yank that support. It’s much the same play they ran against Arlen Specter a couple of years back, threatening to deny him his chairmanship of — again — the Judiciary Committee. It worked then, and there’s no reason to think it won’t work now. This kind of discipline is normal in a parliamentary system where everyone on both sides is expected to support the party line. But that discipline is the flip side of a system in which the majority party has the power to turn its campaign platform into law using only its own votes. You really can’t have one without the other. If you have an intensely whip-based system, in which the opposition party is expected to oppose unanimously, then the majority party has to have to power to govern using only its own majority. Conversely, if you have a system in which legislation only passes if party members cross lines, then discipline necessarily needs to be weak. Not to be tedious about this, but this is yet another example of how Congress has become schizophrenic in the age of the routine filibuster. We either need a system in which the majority rules, or we need a system in which party members cross lines to form temporary alliances. Right now we have neither. Grassley does not want health care reform. Grassley does not want health care reform. 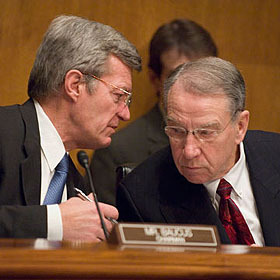 Grassley does not want health care reform. As a result, he does not have a problem. He will string this along in the service of his very very very conservative ideology and in service of the Republican party. But he will not support or vote for it in the end, and he will participate in the Gang of Six only as a way to slow legislative progress as a tool to derail the whole thing. This might go a wee bit too far, but point taken. I was using Ezra’s post as an excuse to blather about the filibuster, but I probably shouldn’t have let his implicit Grassley appraisal stand without comment.